Too many veterans in our community are living in substandard or unsafe living conditions. Everyone has the right to a warm, safe, and stable place to call home. However, for many, it is difficult to keep their home in this shape. When a home starts to fall apart, it has great effects on those living inside, as well. 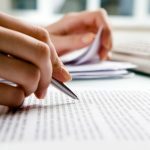 Imagine having HVAC, electrical, or roofing problems and not be able to fix them. Imagine not being able to even go out to buy supplies or even have enough finances to hire someone to fix up you house. This was the case for two veterans: Thomas Hoyer and Richard LaMantia. Thomas Hoyer, 66, served a total of 7 years in the US Air Force & Army. Although handicapped and a senior citizen, Mr. Hoyer has fixed and maintained the house on his own for many years. However, he was recently in an accident that left him hospitalized. 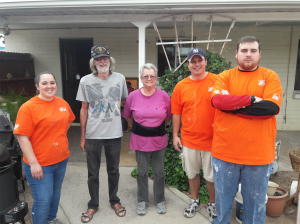 During this time, volunteers from Serenity Baptist and local contractors from the Home Depot Veterans Home Repair came out to his home for repairs. While there, the volunteers worked on major repairs like a new accessible bathroom & shower. Previously, Mr. Hoyer had built an outdoor shower himself that he has been using even in the winter for years. 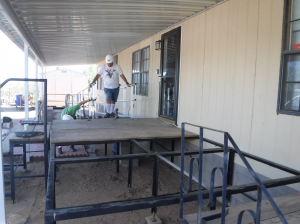 The group of volunteers also replaced worn out plywood from the decking, and installed guardrails all around the house. Richard LaMantia, 72, has been living in his house with his wife for 23 years. Mr. LaMantia served in the U.S. Army for 3 years. 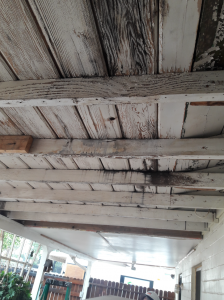 His back porch ceiling was falling apart due to water damage. 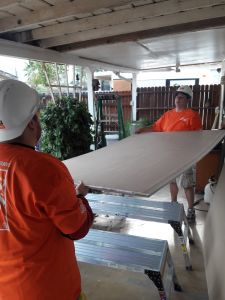 Thanks to the help of Team Depot, volunteers installed new drywall to fix the ceiling in addition to critical home repairs such as HVAC, electrical, and roof work. Richard says they are so grateful for the safety and health repairs that have been completed. 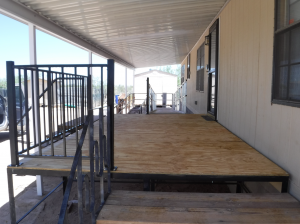 These projects in Tucson are part of The Home Depot’s ongoing efforts to improve the homes and lives of U.S. military veterans and their families. Since 2011, The Home Depot Foundation has transformed 29,900 homes for veterans and 8,300 veteran facilities across the country. Giving back to veterans is personal to The Home Depot, as more than 35,000 of the company’s associates have served in the military. Do you know a veteran or local Tucson homeowner in need of home repairs? 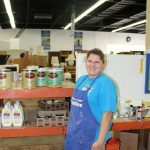 Have them call Habitat for Humanity Tucson at (520) 326-1217 to find out how we can help, or submit an inquiry form today.